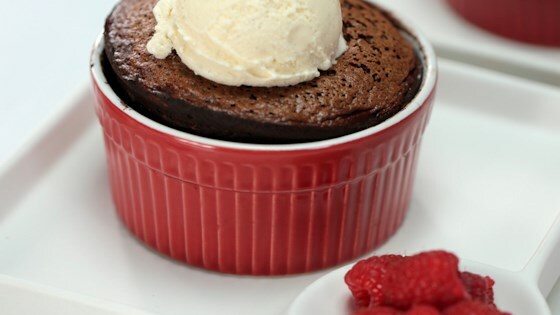 "Make a fun Valentine's Day project out of this recipe for dark chocolate souffles drizzled with a marvelous mocha sauce." Brush the insides of two 8-ounce ramekins with melted butter. Chill for 5 minutes, then brush again with melted butter. Add 1 teaspoon cocoa powder to each ramekin and roll around to evenly coat bottom and sides. Mix flour, 1/4 cup sugar, salt, and cornstarch in a small bowl. Beat egg and egg yolk together in a small bowl. Add to the flour mixture and whisk until a smooth paste forms. Bring cream and milk to a simmer in a small saucepan. Remove from heat; add bittersweet and semisweet chocolate and remaining cocoa powder. Stir until melted and fully combined. Gradually stir the hot chocolate into the flour-egg mixture. Return mixture to the pot and cook on medium-low until thick and smooth, about 5 minutes. Let cool to room temperature, about 20 minutes. Whisk egg whites into soft peaks using an electric mixer. Slowly add 1 teaspoon sugar and keep whisking until stiff peaks form. Carefully fold 1/3 of the chocolate mixture into the egg whites until mostly combined. Repeat with the remaining chocolate mixture. Spoon batter into the ramekins, filling them completely. Tap the ramekins on the counter to help knock out any air bubbles. Bake souffles in the preheated oven until the tops are set but the centers are still a little jiggly, 25 to 30 minutes. Make mocha sauce while souffles are baking. Bring cream to a low simmer in a small saucepan. Add chocolate and espresso powder; whisk until melted and combined. Gradually pour in corn syrup, coffee liqueur, and vanilla extract. Cook on low heat, stirring often, until thickened, about 5 minutes. Remove from heat. Top each souffle with a scoop of ice cream, drizzle with mocha sauce, and garnish with raspberries and chocolate shavings.